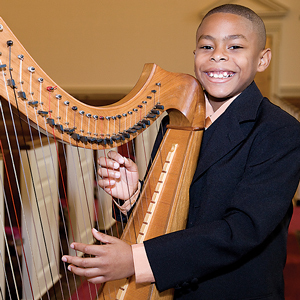 The American Youth Harp Ensemble performs in some of the world’s most prestigious venues, yet many people in Richmond aren’t aware that the world-class group exists. The group’s founder and artistic director, Lynnelle Ediger-Kordzaia, hopes to change that dynamic. On the surface, Ediger-Kordzaia may be soft-spoken and quiet, but the Oberlin Conservatory of Music alum is a working dynamo, passionate not only about the harp but also about teaching its intrinsic value. 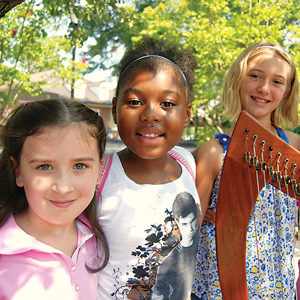 Recognized nationally as a model arts education program, AYHE serves young harpists, ages 8 to 18, through five different performance ensembles beginning with the Troubadour Ensemble for elementary age students. The highest level, the elite Touring Ensemble, consists of a professional-caliber chamber ensemble of 14 harpists that perform nationally and internationally. Many of the programs are offered yearround. “We also have special summer programs for beginning and experienced harpists alike,” Ediger-Kordzaia says. AYHE has 17 national and international tours under its belt, playing in preeminent venues such as the Kennedy Center, Carnegie Hall, the White House, the United Nations, and in the Department of State’s cultural series. Internationally, the group has performed in Paris, London, Vienna, Scotland, and the Netherlands. Bethany Bruno says her life changed the day she first played her harp at Carnegie Hall with the company. Bruno, who is now a Presidential Scholar and freshman at the University of Virginia, performed in the renowned venue with AYHE when she was in seventh grade and again earlier this year when she was a senior in high school. The young harpists met everyone from singers James Taylor and Lionel Ritchie to actresses Meryl Streep and Glenn Close. At one point during the evening, Ediger-Kordzaia caught a glimpse of a woman dancing to the group’s music. That woman, she soon discovered, was famed choreographer Twyla Tharp who made it a point to say AYHE’s performance made her night. While the performance opportunities are exhilarating, it’s the HARPS Foundation that warms Ediger-Kordzaia’s heart. 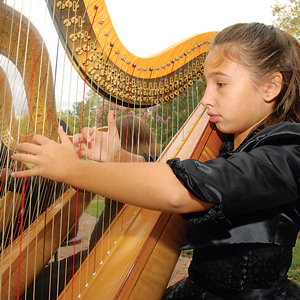 The foundation is a vital part of her vision to not only create awareness of the harp’s therapeutic value, but also to provide programs and performance opportunities for children who wouldn’t have had that opportunity because of their financial means or because of a disability. As part of its mission, the foundation offers three different therapeutic harp programs in partnership with different health care partners. “Our therapeutic harp programs are on the cutting edge of the complementary care movement in the country,” Ediger-Kordzaia says. 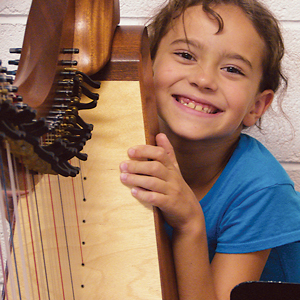 The remaining Noah’s Children Harp Therapy program provides harp therapy in hospital and home hospice settings for children and their families under the Noah’s Children banner as well as harp instruction. Noah’s Children is the only pediatric palliative care organization in central Virginia. Bice finds that students in the program take on more responsibility, develop longer attention spans, and learn to support one another. “Also, their parents have had something to brag about and have had the opportunity to see and hear their children on stage,” she says.